Cal State Monterey Bay freshmen live in the Residence Halls located adjacent to the main area of the campus. These three-story Residence Halls surround the main part of campus. They are within walking distance of classrooms, the library, the Dining Commons, computer facilities, the Media Learning Complex, the Campus Health Center, the Otter Sports Center, and all administrative offices. Meal plan required. All students wanting to live in the Residence Halls must be matriculated CSU Monterey Bay students working toward a degree. Students must also be enrolled full time each semester they reside on-campus. This means 12 units per semester for undergraduates and at least 8 units per semester for graduate students. Private or shared bathrooms in all room. Sample floor plan for Residence Hall triple Occupancy Room. Actual room layouts may vary. 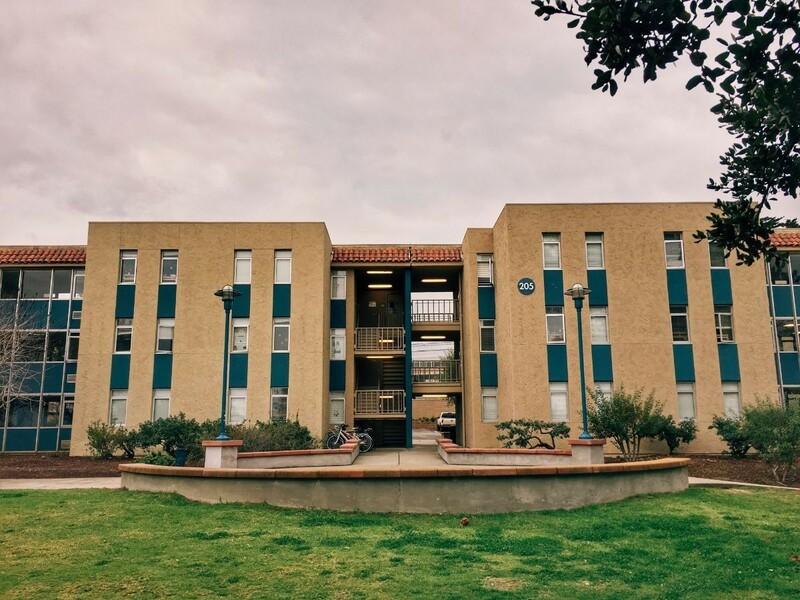 The standard residence hall assignment consists of three students sharing a room. Single rooms are first offered to students registered with Student Disability Resources and are subject to availability. On-site professional and student staff offer assistance to residents. They also coordinate a variety of educational, social, and recreational opportunities throughout the year. Cypress, Asilomar, Willet, and Manzanita Halls are uniformly configured three-story buildings. All rooms are designed for triple and double occupancy and have private bathrooms. Each building is equipped with a mailroom, laundry room, as well as a fully equipped kitchen that includes access to a microwave and stove. Yarrow, Avocet, Tortuga, and Sanderling Halls are three-story buildings with three room styles. Occupants will be assigned to double, triple, or quadruple occupancy rooms with private or shared bathrooms. These Residence Halls have a mail area, TV lounge, a laundry room and a full kitchen and lounge on the first floor.